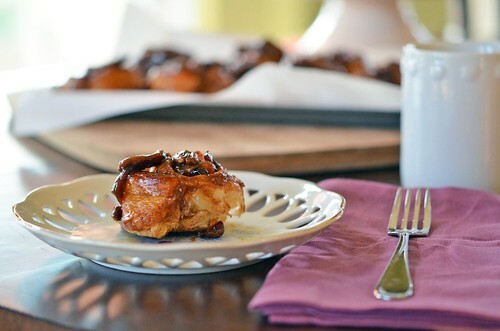 Sticky buns … are they really a breakfast food? Breakfast’s dessert maybe. Lunch and dinner have dessert, but why not breakfast? In all reality, that’s the meal where dessert should be eaten. I mean, it gives us the rest of the day to work off the extra sugar calories. Right? I am down for having a slice of cake after my eggs. 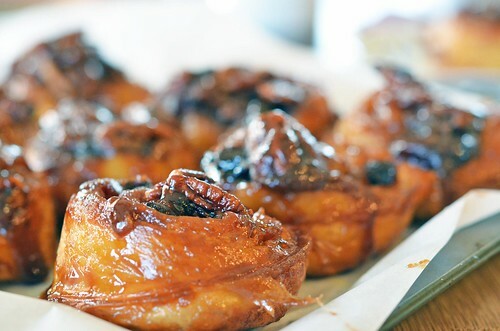 Or one of these here sticky buns. 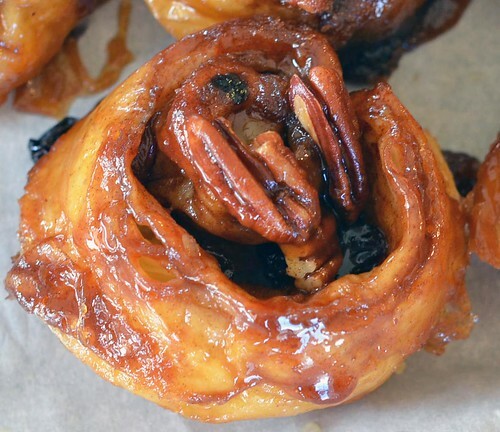 But guess what, these sticky buns are not labor intensive. They were prepared and baked in under an hour. I mean how perfect right? The trick is using store bought puff pastry. Speeds the process up fifty fold…at least. 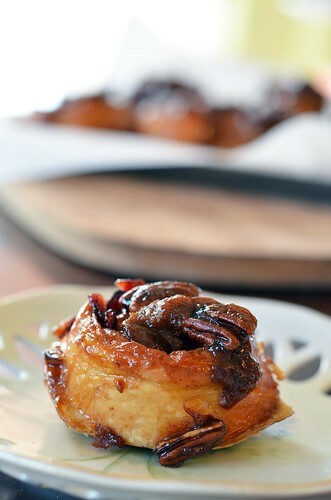 A few pecans and a dollop of brown sugared butter, right in the bottom of the muffin cups. 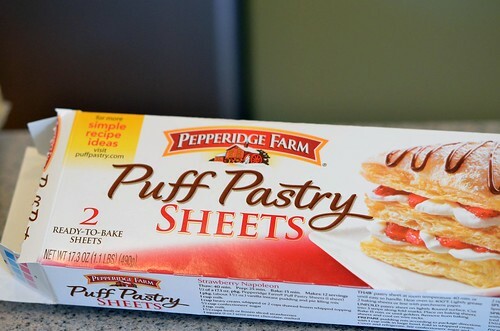 Get yourself a box of puff pastry…found in the freezer section at the grocery. Thaw in the fridge before using. I generally do this overnight. Brush on the melted butter. Butter on butter. Awesome on awesome. 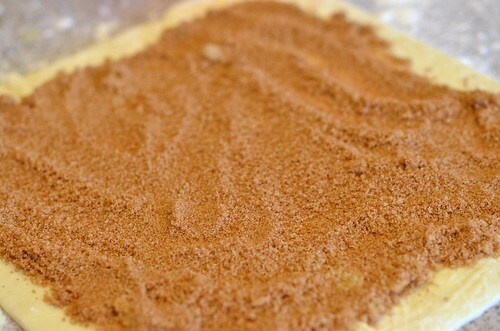 Sprinkle on the spiced brown sugar mixture. Be generous, its good for the soul. Then, toss on some raisins. Roll it up…jelly roll style. Stuff them into the muffin cups. These remind me geoduck clams coming out of the sand…don’t Google a picture of a geoduck clam. You will think I am crazy and you might be grossed out. Just sayin’. And they come out looking like this. A cookie sheet under the muffin tin is necessary. 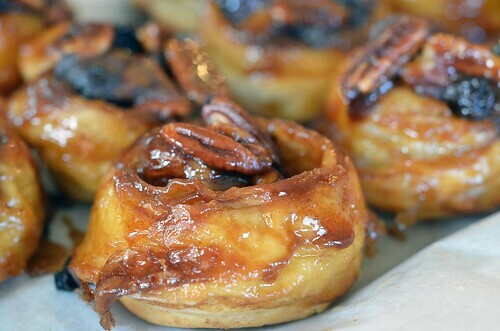 See all the gooey brown sugar buttery goodness…it will smoke you out of your house if it drips in your oven. Trust me. Flip ’em out. Tasty sons a guns. I love how this picture makes it look like I ate my sticky bun like a lady. However, I totally scarfed mine while standing at the counter watching the end of an Indians game. That’s how I roll. 2 Sheets Puff Pastry (1 box), thawed – but chilled. In a small bowl, beat together 1/3 cup brown sugar and butter. Divide the pecan pieces between the 12 muffin cups. 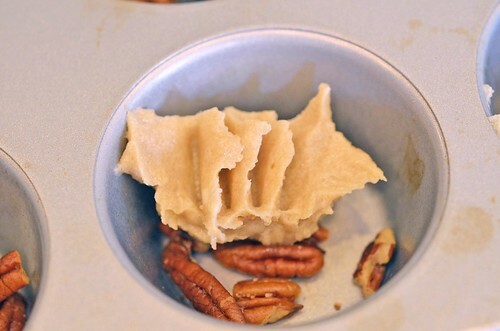 Spoon the brown sugar butter mixture over the pecan pieces – about 1 tablespoon each. Set aside. In another small bowl, stir together 3/4 Cup brown sugar, cinnamon, and cardamom. 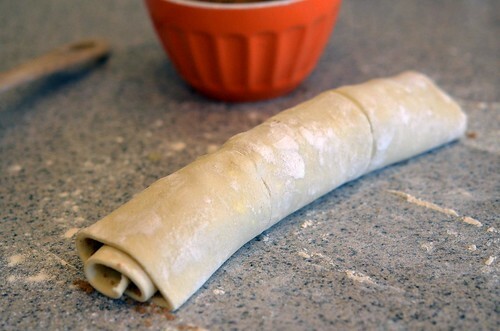 Remove puff pastry from refrigerator. 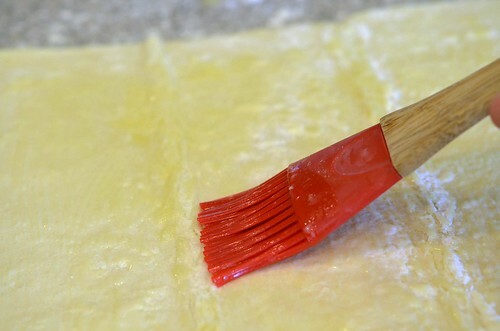 Sprinkle work surface with flour and unfold puff pastry onto work surface. Work perpendicular to the creases (have them open like a book). Brush melted butter onto puff pastry, leaving a small border. 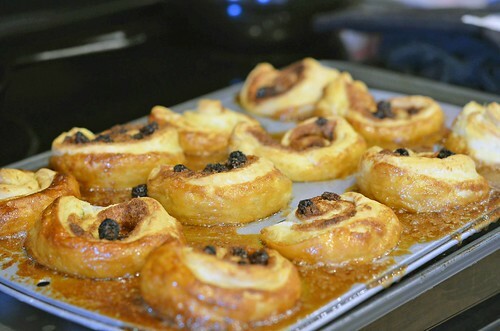 Sprinkle 1/2 of the brown sugar mixture and 1/2 of the raisins onto the puff pastry, spreading it out evenly. 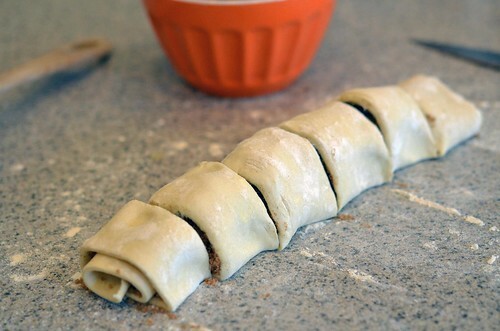 Starting with the edge closest to you, tightly roll up the puff pastry sheet into a long tube. With a sharp knife, cut the roll into 6 pieces. 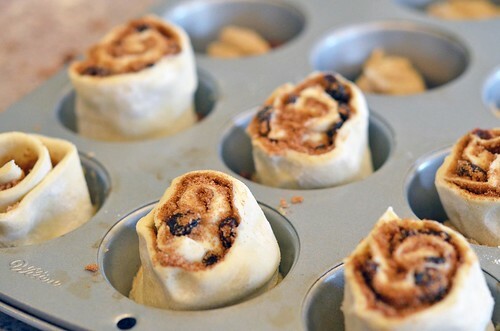 (cut in half, and then cut each half into thirds) Place each piece into the prepared muffin tin, pressing them lightly into the brown sugar/butter/pecan mixture. Place muffin tin on a cookie sheet (to catch drippings) and bake for 30 to 35 minutes, or until golden brown and firm to the touch. Remove from oven and let sit for 5 minutes. Flip them out onto a parchment paper lined cooling rack. 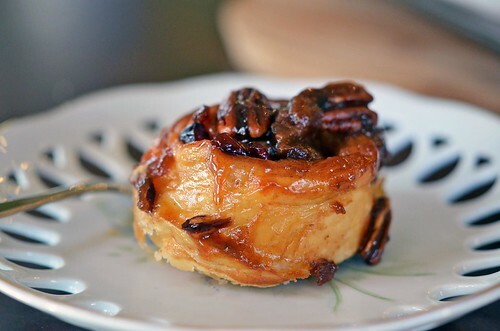 Scoop out any pecans/glaze that remains in the muffin cups and place a top the buns. Let cool completely.